The Faces Flows feature of JavaServer Faces technology allows you to create a set of pages with a scope, FlowScoped, that is greater than request scope but less than session scope. For example, you might want to create a series of pages for the checkout process in an online store. You could create a set of self-contained pages that could be transferred from one store to another as needed. Faces Flows are somewhat analogous to subroutines in procedural programming, in the following ways. Like a subroutine, a flow has a well defined entry point, list of parameters, and return value. However, unlike a subroutine, a flow can return multiple values. Like a subroutine, a flow has a scope, allowing information to be available only during the invocation of the flow. Such information is not available outside the scope of the flow and does not consume any resources once the flow returns. Like a subroutine, a flow may call other flows before returning. The invocation of flows is maintained in a call stack: a new flow causes a push onto the stack, and a return causes a pop. An application can have any number of flows. Each flow includes a set of pages and, usually, one or more managed beans scoped to that flow. Each flow has a starting point, called a start node, and an exit point, called a return node. The data in a flow is scoped to that flow alone, but you can pass data from one flow to another by specifying parameters and calling the other flow. Flows can be nested, so that if you call one flow from another and then exit the second flow, you return to the calling flow rather than to the second flow’s return node. You can configure a flow programmatically, by creating a class annotated @FlowDefinition, or you can configure a flow by using a configuration file. The configuration file can be limited to one flow, or you can use the faces-config.xml file to put all the flows in one place, if you have many flows in an application. The programmatic configuration places the code closer to the rest of the flow code and enables you to modularize the flows. Figure 16-1 shows two flows and illustrates how they interact. In this figure, Flow A has a start node named flow-a and two additional pages, next_a1 and next_a2. From next_a2, a user can either exit the flow using the defined return node, taskFlowReturn1, or call Flow B, passing two parameters. Flow A also defines two inbound parameters that it can accept from Flow B. Flow B is identical to Flow A except for the names of the flow and files. Each flow also has an associated managed bean; the beans are Flow_a_Bean and Flow_b_Bean. In this example, flow-a is defined programmatically in FlowA.java, while flow-b is defined by the configuration file flow-b-flow.xml. The simple-flow example application demonstrates the most basic building blocks of a Faces Flows application and illustrates some of the conventions that make it easy to get started with iterative development using flows. You may want to start with a simple example like this one and build upon it. This example provides an implicit flow definition by including an empty configuration file. A configuration file that has content, or a class annotated @FlowDefinition, provides an explicit flow definition. The source code for this application is in the tut-install`/examples/web/jsf/simple-flow/` directory. The simple-flow example has an empty configuration file, which is by convention named flow-name-flow.xml. The flow does not require any configuration for the following reasons. The flow does not call another flow, nor does it pass parameters to another flow. The flow uses default names for the first page of the flow, flow-name`.xhtml`, and the return page, flow-name`-return.xhtml`. This example has only four Facelets pages. simple-flow.xhtml and simple-flow-page2.xhtml, the two pages of the flow itself. In the absence of an explicit flow definition, the page whose name is the same as the name of the flow is assumed to be the start node of the flow. In this case, the flow is named simple-flow, so the page named simple-flow.xhtml is assumed to be the start node of the flow. The start node is the node navigated to upon entry into the flow. It can be thought of as the home page of the flow. The Facelets pages use only flow-scoped data, so the example does not need a managed bean. In the Projects tab, right-click the simple-flow project and select Build. This command builds and packages the application into a WAR file, simple-flow.war, that is located in the target directory. It then deploys the application to the server. On the index.xhtml page, click Enter Flow. On the first page of the flow, enter any string in the Value field, then click Next. On the second page of the flow, you can see the value you entered. Click Return. On the return page, an empty pair of quotation marks encloses the inaccessible value. Click Back to Start to return to the index.xhtml page. The checkout-module example application is considerably more complex than simple-flow. It shows how you might use the Faces Flows feature to implement a checkout module for an online store. Like the hypothetical example in Figure 16-1, the example application contains two flows, each of which can call the other. Both flows have explicit flow definitions. One flow, checkoutFlow, is specified programmatically. The other flow, joinFlow, is specified in a configuration file. The source code for this application is in the tut-install`/examples/web/jsf/checkout-module/` directory. For the example, index.xhtml is the beginning page for the application as well as the return node for the checkout flow. The exithome.xhtml page is the return node for the join flow. The configuration file joinFlow-flow.xml defines the join flow, and the source file CheckoutFlow.java defines the checkout flow. The checkout flow contains four Facelets pages, whereas the join flow contains two. The managed beans scoped to each flow are CheckoutFlowBean.java and JoinFlowBean.java, whereas CheckoutBean.java is the backing bean for the index.html page. This page is also the return node for the checkout flow. The Facelets page exithome.xhtml is the return node for the join flow. This page has a button that allows you to return to the index.xhtml page. The four Facelets pages within the checkout flow, starting with checkoutFlow.xhtml and ending with checkoutFlow4.xhtml, allow you to proceed to the next page or, in some cases, to return from the flow. The checkoutFlow.xhtml page allows you to access parameters passed from the join flow through the flow scope. These appear as empty quotation marks if you have not called the checkout flow from the join flow. The action returnFromCheckoutFlow is defined in the configuration source code file, CheckoutFlow.java. The calljoin action is also defined in the configuration source code file, CheckoutFlow.java. This action enters the join flow, passing two parameters from the checkout flow. For this flow, the actions callcheckoutFlow and returnFromJoinFlow are defined in the configuration file joinFlow-flow.xml. If you use an application configuration resource file to configure a flow, it must be named flowName`-flow.xml`. In this example, the join flow uses a configuration file named joinFlow-flow.xml. The file is a faces-config file that specifies a flow-definition element. This element must define the flow name using the id attribute. Under the flow-definition element, there must be a flow-return element that specifies the return point for the flow. Any inbound parameters are specified with inbound-parameter elements. If the flow calls another flow, the call-flow element must use the flow-reference element to name the called flow and may use the outbound-parameter element to specify any outbound parameters. The id attribute of the flow-definition element defines the name of the flow as joinFlow. The value of the id attribute of the flow-return element identifies the name of the return node, and its value is defined in the from-outcome element as the returnValue property of the flow-scoped managed bean for the join flow, JoinFlowBean. The names and values of the inbound parameters are retrieved from the flow scope in order (flowScope.param1Value, flowScope.param2Value), based on the way they were defined in the checkout flow configuration. The flow-call element defines how the join flow calls the checkout flow. The id attribute of the element, callcheckoutFlow, defines the action of calling the flow. Within the flow-call element, the flow-reference element defines the actual name of the flow to call, checkoutFlow. The outbound-parameter elements define the parameters to be passed when checkoutFlow is called. Here they are just arbitrary strings. If you use a Java class to configure a flow, it must have the name of the flow. The class for the checkout flow is called CheckoutFlow.java. "/" + flowId + "/" + flowId + ".xhtml"). The class performs actions that are almost identical to those performed by the configuration file joinFlow-flow.xml. It contains a single method, defineFlow, as a producer method with the @FlowDefinition qualifier that returns a javax.faces.flow.Flow class. The defineFlow method takes one parameter, a FlowBuilder with the qualifier @FlowBuilderParameter, which is passed in from the JavaServer Faces implementation. The method then calls methods from the javax.faces.flow.Builder.FlowBuilder class to configure the flow. First, the method defines the flow id as checkoutFlow. Then, it explicitly defines the start node for the flow. By default, this is the name of the flow with an .xhtml suffix. The method then defines the return node similarly to the way the configuration file does. The returnNode method sets the name of the return node as returnFromCheckoutFlow, and the chained fromOutcome method specifies its value as the returnValue property of the flow-scoped managed bean for the checkout flow, CheckoutFlowBean. The inboundParameter method sets the names and values of the inbound parameters from the join flow, which are retrieved from the flow scope in order (flowScope.param1Value, flowScope.param2Value), based on the way they were defined in the join flow configuration. The flowCallNode method defines how the checkout flow calls the join flow. The argument, calljoin, specifies the action of calling the flow. 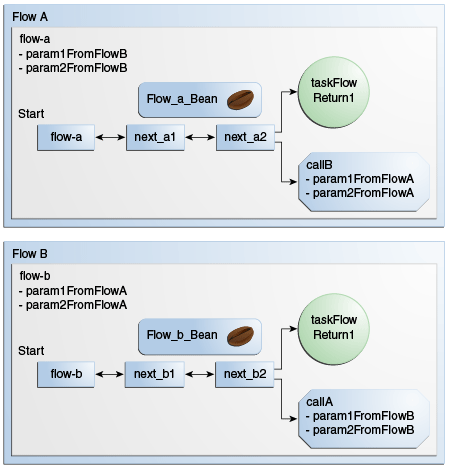 The chained flowReference method defines the actual name of the flow to call, joinFlow, then calls outboundParameter methods to define the parameters to be passed when joinFlow is called. Here they are values from the CheckoutFlowBean managed bean. Finally, the defineFlow method calls the getFlow method and returns the result. Each of the two flows has a managed bean that defines properties for the pages within the flow. For example, the CheckoutFlowBean defines properties whose values are entered by the user on both the checkoutFlow.xhtml page and the checkoutFlow3.xhtml page. For the JoinFlowBean, the return node is the exithome.xhtml page. In the Projects tab, right-click the checkout-module project and select Build. This command builds and packages the application into a WAR file, checkout-module.war, that is located in the target directory. It then deploys the application to the server. The index.xhtml page presents hypothetical results of the shopping expedition. Click either Check Out or Join to enter one of the two flows. Follow the flow, providing input as needed and choosing whether to continue, go back, or exit the flow. In the checkout flow, only one of the input fields is validated (the credit card field expects 16 digits), so you can enter any values you like. The join flow does not require you to check any boxes in its checkbox menus. On the last page of a flow, select the option to enter the other flow. This allows you to view the inbound parameters from the previous flow. Because flows are nested, if you click Exit Flow from a called flow, you will return to the first page of the calling flow. (You may see a warning, which you can ignore.) Click Exit Flow on that page to go to the specified return node.